Snow, sun and superb surroundings. 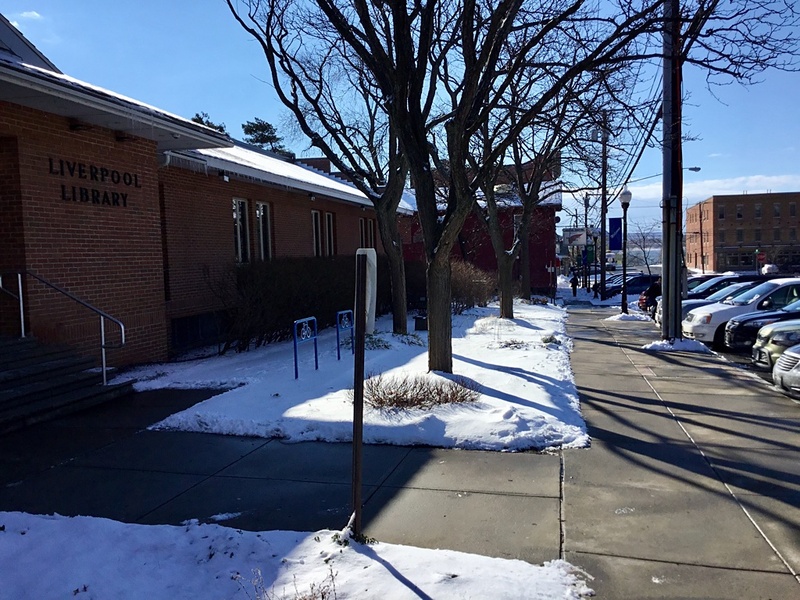 The call of outdoor duty was strong Wednesday before my lunch break at the Liverpool Public Library. It looked fine from the second-floor windows. So I grabbed a lens and headed down the stairs. Could we not use some sun-drenched, sun-sparkled photos of the library for our files? I think Feb. 1, 2017, looked pretty bright in the Village of Liverpool, from our building on the corner of Second Street right on down Tulip to Onondaga Lake. What is the setting outside where you work? Do you get to throw on a jacket and visit the outdoors or must you stay inside at your desk? I can step outside at lunch, although I rarely avail myself of that permission. Additionally, I rarely talk about my work in my blog. However, now that you bring it up, a few pictures of the Mohawk Valley under the winter sun would be a good idea. I can almost feel the cold looking at your picture. There is something about a cold sunny day, isn’t there? That’s a great view, Kathryn Grace. Wonderful workplace when you can make a go of it! thanks mark for the reminder to actually get that camera out of my glovebox and use it. And to post more pics of australia. your little town looks really nice. Use it for sure, Louise. Sharing your part of the world is wonderful.